flavius belisarius: the man who almost reunited the western and eastern roman empire; the man who saved byzantium time and time again and who allowed it to endure 900 years after he left the earth. who knows what the world would be like had his emperor justinian allowed belisarius more room and resources in the mission to reunite the old empires. in his second chapter in the savior generals, hanson delves into the life and battles of belisarius and how he saved his emperor time and time again. these two men's destinies would forever be linked. let me first quote a paragraph from toward the end of the chapter. this paragraph summarized the three decade-long mission that justinian envisioned and how his best general - belisarius - almost single-handedly attained that mission. "a thirty-year career (529-59) saw the last of the romans fighting to save the beleaguered eastern empire in mesopotamia against persians, only to return home to rescue his emperor justinian from the nika riots in the hippodrome. then he left for north africa and in months destroyed the centurylong vandal empire whose ravages had so dominated the last thoughts of saint augustine. after that he sailed for sicily, and for a time reclaimed the idea of a roman italy from the mediterranean to the po - only to go eastward again to meet the persians, and then back again to a collapsing italy, and then back to constantinople to internal exile, trials, and humiliation, only while in forced retirement to save the city from a raid of huns - and earn a final rebuke." in each of the campaigns, belisarius was able to overcome hordes of forces with a very small force. he was extremely smart and savvy in his approach in out-smarting the enemy. much like i did with themistocles, let me list out the words that were repeatedly used to describe how belisarius accomplished his mission over and over and over again. calm in battle, knew difference between tactics and strategy, skilled in counterinsurgency, winning the hearts and minds of local populations, restraint, tactics-morale-generalship, learned to carefully deploy his limited forces against numerically superior opponents, show both force and mercy to locals, did not rashly commit his outnumbered forces, methodic, moderation brings salvation, insurgency, audacious, hit enemy hard and quickly at opportune times, he is quoted as saying "not by the number of men, and not by the measure of one's body, but by the valor of the soul, war is decided", popular icon, mythic status, legendary character, personal habits, clemency, honesty, lenient, saintly conqueror, personally attended his wounded, replaced lost equipment of his soldiers at his own expense, treated personal property sacrosanctly, avoided alcohol-womanizing-bribery, resilient, dynamic, tactical brilliance, personal magnetism, faithful, planner, constantly sought to adopt, improvise, and invent to make up for what he lacked in manpower, usually lost small and won big, confident, not susceptible to panic, neither vain nor prone to softness. what amazes me is his character. after all the battles he fought for justinian, he never sought to overthrow him. 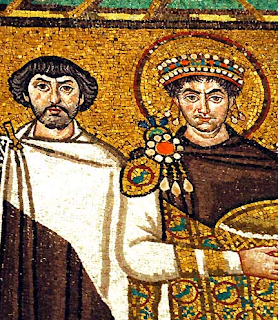 it appears there were always rumors that belisarius sought power and for that justinian would always undercut his best general, but belisarius never took advantage. even when he was old and was recalled out of retirement to fight off the huns - if there were ever an opportune time to take command for himself, this would be it - but he did not. he was always in the service of his country and emperor. vdh and other historians wonder "what if" the plague that hit the empire at the worst time had indeed not hit them; and if justinian would have used belisarius to the fullest extent if somehow the old roman empire were reunited - what the world would look like today. instead, the western empire fully crumbled and the eastern empire was able to survive another 900 years - long enough for the renaissance to begin.